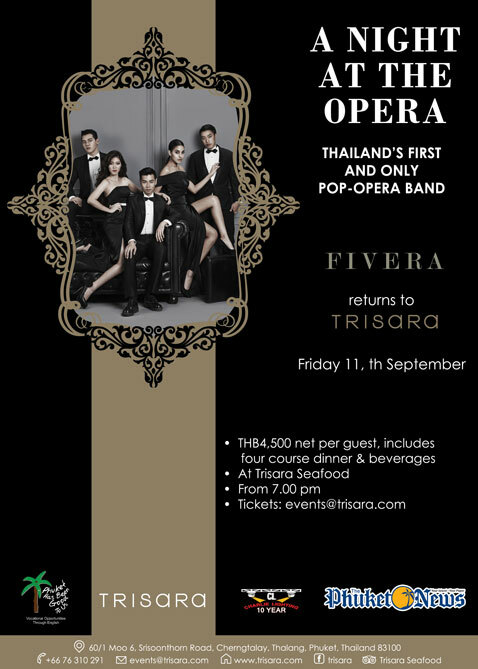 “A Night at the Opera” It will be a night of elegance as guests gather for a concert under the stars to the music of FIVERA, Thailand’s first and only pop-opera band. Performing a blend of popular operatic arias and classical pieces.Tickets THB4,500 net per guest, includes four course dinner & beverages. Book your tickets now, send an email to events@trisara.com. Proceeds go towards supporting the work of Phuket Has Been Good To Us in making a difference to the lives of underprivileged Thai children in Phuket. Proudly supported by The Phuket News.